Report cards help teachers communicate with students’ parents about performance across subjects and overall school activities. Therefore, as an important communications and evaluation tool, report cards need to be clear and well-designed. While computing, deliberating and finalizing your students’ grade is a challenge all teachers have to go through, designing one need not be. Even with little to zero design experience, creating informative and visually engaging report cards is quick and easy with Canva. Choose from hundreds of professionally-made templates in our library and customize them using our suite of design elements. With our editor’s intuitive and drag-and-drop simplicity, you can focus your time and effort describing your students’ performance and hard work in school as accurately and comprehensively as possible. 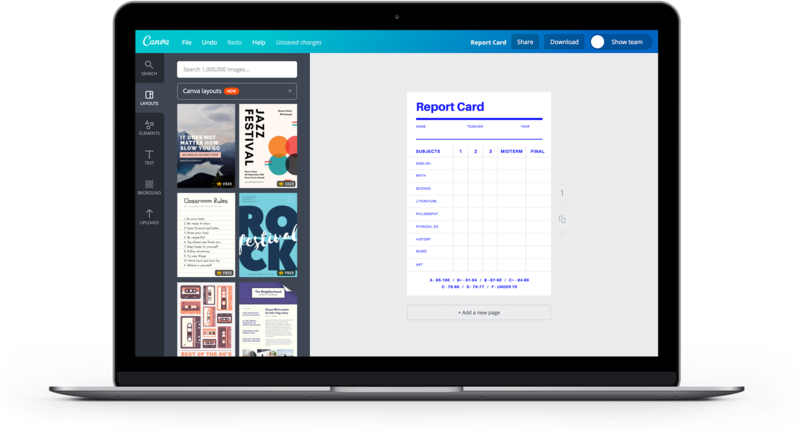 Create a new Canva account to get started with your own report card designs. Schools are unique and report cards should definitely reflect this. With hundreds of templates and thousands of design elements to choose from, you’re one click away from a distinct report card you will use every year. Start with choosing a report card template made by our team of professional designers. From there, you can start editing information by changing the text and colors to match your school’s branding. You can also remain consistent with your school’s identity by inserting your logo and other existing graphics on the report card using our upload tool. A critical part of creating a report card is deliberating the final grade and getting the feedback of your co-teachers. However, a teacher’s schedule can often get too busy, especially during finals week, turning on-site collaboration into a great challenge. Thankfully, Canva makes collaboration as easy as sending or emailing a link to your report card design. Click on the Share button on the editor toolbar to get your design’s unique link. Choose whether to give them editing or viewing access before sending your invitation via email or just messaging them the link. Anyone you choose to share the link to can then access your design by logging into their own Canva account on any computer, iPhone, iPad or Android device. With Canva, you have the option to create your student evaluations digitally or use a pen for a personalized, handwritten touch. Want to go digital? On the design app, click the ‘Copy this page’ icon to make several copies of your report card for your students. Use our text editor to add their names, grades, and evaluations. Save your report card in a PNG or JPEG file and it’s ready as an email attachment to parents or for printing. Want to add a part of your assessment by hand? Save your report cards in a high-res PDF file, print, and start writing on it! Simply head on over to www.canva.com to start creating your report card design. You don’t need to download Canva, just create an account and log in. If you want to design on the go, download our free iPhone and iPad apps from the App Store or our free Android app from Google Play. How can I add my school's logo to my design? Include your school logo into your report card design by uploading it into Canva. To upload your logo, click on the Uploads tab in your object panel, select the Uploads folder, and click on the green Upload your own images button. Select any PNG, JPEG or SVG file you wish to upload from your computer.